I’m writing this post from my bedroom in Amsterdam. Coming home is still part of any trip, but I’m avoiding to think how I feel now (terrible!!) and concentrate in summarizing what happened last month of my first walkabout. I realized that this trip is changing me in a way I’ll only figure out in the future, long time after landing back home. It’s great to make plans, and it’s greater to screw them up. At the end of July I was enjoying Cali. 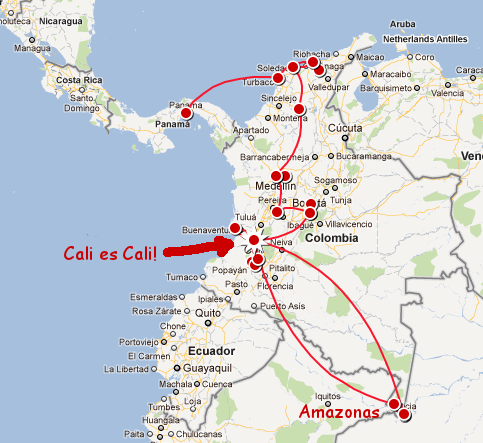 So much that I decided not to continue visiting Ecuador, Peru’, Bolivia and down to Buenos Aires (the so called “original idea“), but to stay in the capital of Salsa, using Cali as base to continue discovering the beautiful Colombia. So I arranged some weekends outdoor. Like the one in Popayan, called “the white town” for the colonial buildings, together with the termals of Coconuco opens 24h day. And the last trip was a flight to Leticia, in the Colombian Amazonas, for a week walking in the jungle, eating good fish and sleeping, for my first time, under the stars of the beautiful south-hemisphere sky. Every time coming back to Cali to keep on preparing my Salsa graduation show, do Yoga everyday and enjoy the “coming home” feeling. That’s very different than changing place every few days, like I did in the first half of my walkabout, and to be honest I liked it more. I went out a Sunday morning and found a grocery shop playing Salsa in the street. I took classes of caleno style from Luz Ayde’ from Son de Luz, World Champion dancer and choreographer. I went to visit the bar of “The Lebron Brothers” salsa band and stop the day after talking with Jose’ Lebron, the man that wrote some of my favorite songs like “que pena”, “diez lagrimas” and “la temperatura”. I was to an audition, an event where salsomanos meet to listen and learn about a specific artist (this time was about the “Conjunto Libre” band). But the best Salsa experience of all was performing my choreography in an hostel party to get graduated in Salsa calena the Sunday before leaving!!! In Cali many travelers, beside me, get trapped. People arrive for few days and stay for weeks. So it was a good place to get to know people better than normal. Of them all, I became good friend with Claudio, AKA “el papi”, a very interesting Italian ex-journalist traveling the World since 7 years and now living as Yoga teacher and masseur. We got along very well (when I didn’t feel like killing him) and we traveled outside Cali together, beside sharing endless conversations and gossips (another advantage of staying in the same place for some time :D). Thinking that not having a PC will keep you far from Internet is like thinking that not bringing an umbrella will avoid the rain. Internet is everywhere, and the solution to don’t spend too much travel time online is simple: self-discipline and be interested in what’s around you. In the future I will bring a netbook and I’ll just be aware of the time I spend on it. I’ll avoid waiting to use crappy hostel PCs and all sort of technical problems with them (camera not recognize, slowness, rotten keyboards, typing username and passwords, and security). Nobody seemed less interesting than the folks spending all day behind their notebook! And the total for August is…. This is more or less the same I spent in July, 40 EUR/day.